Are you hesitant to try out different facial hair styles as you don’t have the tools for it? Finding it difficult to maintain different sets of trimmers? Here is the answer for all your worries. 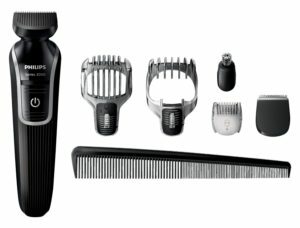 The QG3342/23 Series 3000, 6-in-1 waterproof men’s grooming kit from Philips is a product that offers you complete ease of operation. With this single product, you can try out various looks and sport trendy styles, without any hassles. The ground Chromium steel blades are self-sharpening and are very safe for your skin. This product gives you complete freedom to trim exactly up to the level that you want to, as there are 18 types of length settings that come along with this unit. Once you charge this trimmer for about 10 hours, you can use it as a cordless unit for a full 60 minutes, which is truly incredible indeed! Once you have finished using this trimmer, you can wash it easily. This makes it very easy to maintain as well. What comes along with this? The main purpose of getting a trimmer is to be able to create new styles effectively. This trimmer from Philips helps users do a great job in this aspect. Yes, you might see hair strewn all over your floor once you are done with trimming; however, it can be cleaned with a vacuum cleaner in a jiffy. This trimmer offers you the luxury of 6 different trimming styles at a reasonable price of £20, which makes it a nice buy. Try it out if you are looking for an affordably priced trimming product and you will not be disappointed! Thanks for reading and we hope you liked the beard trimmer review for the Philips QG3342/23.